In 2003 the Bush Administration's New Freedom Commission asked mental health service providers to begin promoting ""recovery"" rather than churning out long-term, ""chronic"" mental health service users. Recovery's Edge sends us to urban America to view the inner workings of a mental health clinic run, in part, by people who are themselves ""in recovery"" from mental illness. In this provocative narrative, Neely Myers sweeps us up in her own journey through three years of ethnographic research at this unusual site, providing a nuanced account of different approaches to mental health care. Recovery's Edge critically examines the high bar we set for people in recovery through intimate stories of people struggling to find meaningful work, satisfying relationships, and independent living. "Recovery's Edge is a stunningly compelling read, infused with a fierce energy, inspired by the author's family experience with 'the chaotic mental health system of "care"' in America. 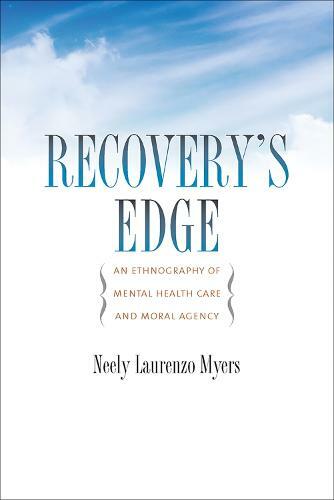 Neely Myers's ethnographic study of mental health care and the current American Recovery Movement takes readers to the very centers of the recovery revolution where patients once in care have become the charismatic leaders in charge. Passionate advocates, they draw on their charismatic talents and the support of some visionary mental health professionals to transform public mental health care from traditional rehabilitation models to practices promoting recovery as advocated care including peer empowerment programs." "A beautiful and riveting ethnography. Neely Myers provides a powerful argument for the necessity of examining madness in relation to fundamental human processes of recognition and belonging. With fierce compassion and in exquisite detail, Myers demonstrates that one need not travel to the global south to encounter the structural violence and inadequacy of mental health care. Essential reading for students of the social and health sciences, persons struggling toward recovery, and all interested in extraordinary conditions." "Choice, moral agency, empowerment, 'patient-centered' care, user-run services, peer staff, recoveries! All so easily envisioned on paper, in mental health policies, and at conferences. As Myers shows us, doing the work to make these ideas happen in daily life is inestimably trying, unpredictable, unruly, and tumultuous for all concerned." "Well written and morally compelling, this rich ethnography details both the new promise of recovery from schizophrenia and its pitfalls in an American context. In the process, it explains how the experience of schizophrenia is shaped for so many by American values of individualism, independence, and work. The book vividly illustrates the way social expectations shape psychiatric experience." "This gripping account shows how the ideals of recovery are reshaping the moral world of US mental health services. In a warm and intimate tone, Neely Myers explores the personal experience of severe symptoms and the human stakes of psychiatric reform. Recovery's Edge is a crucial intervention into policy debates, but one based in ordinary people's stories of loss and resilience."